CHS54.NET: My Son Just Became a Brigadier General! Imagine the bumper sticker that Pat and Zara Faulkner could put on their car!! "Wm Mark Faulkner, the son of Pat Faulkner (Col. USMC, Ret.) 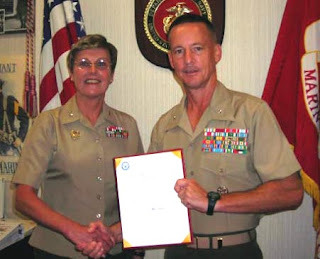 and Zara Kelly Faulkner, both Central High School graduates of classes 1954 and 1955 respectively, was recently promoted to the rank of Brigadier General, United States Marine Corps. General Faulkner is a graduate of Havelock High School, Havelock, NC, a graduate of East Carolina University with a Bachelor of Science Degree in Business Administration, holds a Masters Degree in business from Chaminade University, is a distinguished graduate of the Marine Corps Amphibious Warfare School, Quantico, VA, a distinguished graduate of the Air Force Command and Staff College, Montgomery, AL, and holds a Master of Science Degree in National Resource Strategy from the Industrial College of the Armed Forces." BrigGen Mark Faulkner, USMC, being promoted by MajGen MaryAnn Krusa - Dossin, USMC. (Mark may be the only male general officer in the Marine Corps to have ever been promoted by a female general officer). "Mark entered the world somewhat a Marine as he was born at Marine Corps Air Station Cherry Point, North Carolina. He officially entered the Marine Corps in 1982 and has served his country throughout the world. His service includes tours of duty in support of Operation Desert Storm (First Iraqi War), duty with United Nations Forces in the former Yugoslavia, duty with US Central Command where he participated in Operations Southern Watch, Desert Fox, and Noble Response, humanitarian operations in Africa and elsewhere. He also served tours at Headquarters Marine Corps and with the Joint Chiefs of Staff in Washington, DC. In addition to the first Iraqi war his combat experience includes the initial invasion of Afghanistan where he provided offshore logistic support for Marine Operations far inland. The distance was record setting in the annals of Marine Corps amphibious operations. He recently served another 13 month tour of duty in support of Operation Iraqi Freedom for the liberation of An Bar Province which has now been returned to full Iraqi protection. Upon his return from Iraq Mark accepted command of the 2nd Marine Logistics Group at Camp Lejeune, NC." "Mark's personal awards include two awards of the Legion of Merit with Combat "V", the Bronze Star Medal, two awards of the Defense Meritorious Service Medal, the Meritorious Service Medal, Joint Service Commendation Medal, Joint Service Achievement Medal, Navy/Marine Corps Achievement Medal, and the Combat Action Ribbon. He is also a recipient of the League of Latin American Citizens "Excellence in Military Services Award" for 2007. His decorations also include many national and service related unit awards. Mark is also a marathon runner with very respectable times in both the Boston and Marine Corps events." "Mark is currently assigned by the Commandant of the Marine Corps as the Commanding General of the Third Marine Logistics Group in support of the Third Marine Expeditionary Force in Okinawa, Japan. He is married to the former Janet Etter, also of Marine heritage (father is a retired Colonel), of New Bern, NC. Mark and Janet have two children, Amanda Faulkner of Jacksonville, FL, and Kate Faulkner, a Sophomore at East Carolina University, Greenville, NC." "Mark's family and friends are very proud of his achievements." ...and, congratulations to two very proud parents!